I’ve been seeing lots of sushi burrito pictures lately, but I haven’t found anyplace close by to get one yet. So does that stop me?? No. And it shouldn’t stop you, either! 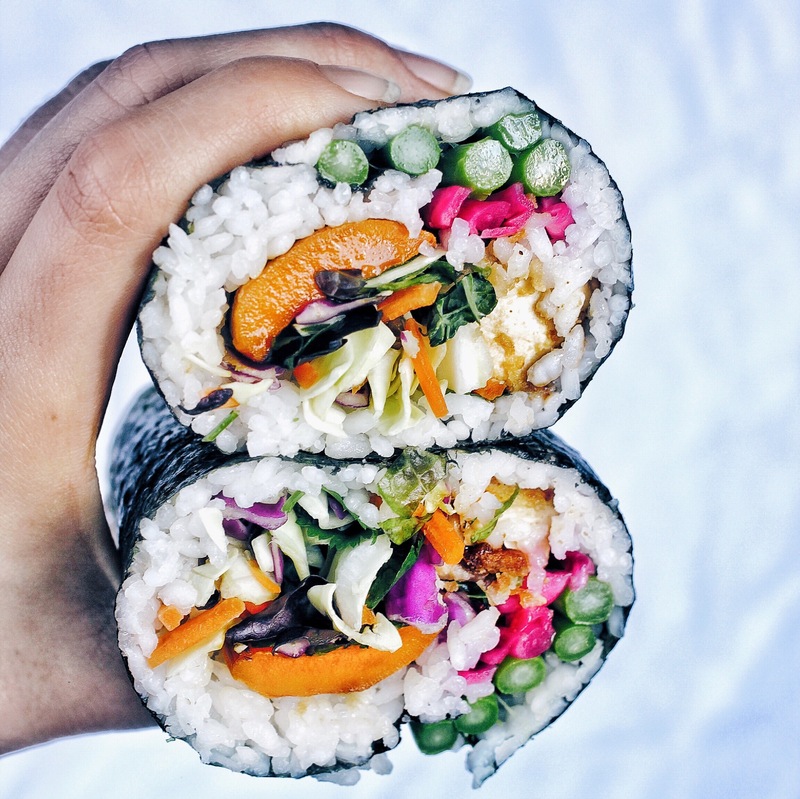 Here is my recipe for a vegan sushirrito, sure to fill those sushi cravings. Prepare the pickled red cabbage the night before. Place the following ingredients in a pint-sized jar, shake, and store in the fridge overnight. Begin draining your tofu an hour and a half before you want your meal ready. Wrap it around with some absorbent towels several times, and then place something heavy on top, like a cutting board. Let it sit like that for 15 minutes. Then place in a bowl and mix with the tahini dressing from the salad kit. Marinate it for 1 hour. Prepare your sushi rice according to instructions. Season to taste with sushi seasoning. While the rice is cooking, scrub your sweet potato clean, peel, then slice into ¼ inch strips. Mix the soy sauce, sesame oil, and maple syrup to form a glaze. Use a basting brush to glaze each side of the potatoes. Place on a foil-covered baking sheet and bake for 20 minutes, flipping halfway through. Remove and set aside. Wash asparagus, then steam in a steamer for 4 minutes. Set aside. Take your tofu and slice it into ½ inch strips. Crush the tortilla strips and sunflower seeds from the salad kit and mix together with the corn starch. Heat some sesame oil in a pan. Cover all sides of the tofu strips with the sunflower seed mixture, then place them on the pan. Flip until golden brown all around. Set aside. Once all the sushi ingredients are prepared, assemble your sushirritos. Place a sheet of nori on the bamboo rolling mat (rough side up), followed by a thin layer of rice. Add your prepared ingredients in any order, not forgetting the salad mixture. Add a drizzle of soy sauce, if desired.